And a sub-group of Innocent is Detective. and a 75% chance of being an Innocent. When a player is killed, their name in the Scoreboard does not move from Terrorists to Confirmed Dead until their body has been found. If you see a body, look at it, and text will appear telling you whether it has been found yet (and if so, the name of who found it). If it has not been found, walk upto it, and press E while looking at it. A Body Search Results menu will appear which gives information as to whether the body is of a Traitor, Detective, or Innocent, and other information. This menu can be accessed at any time by pressing E while looking at the body. And it will tell you the player's name. 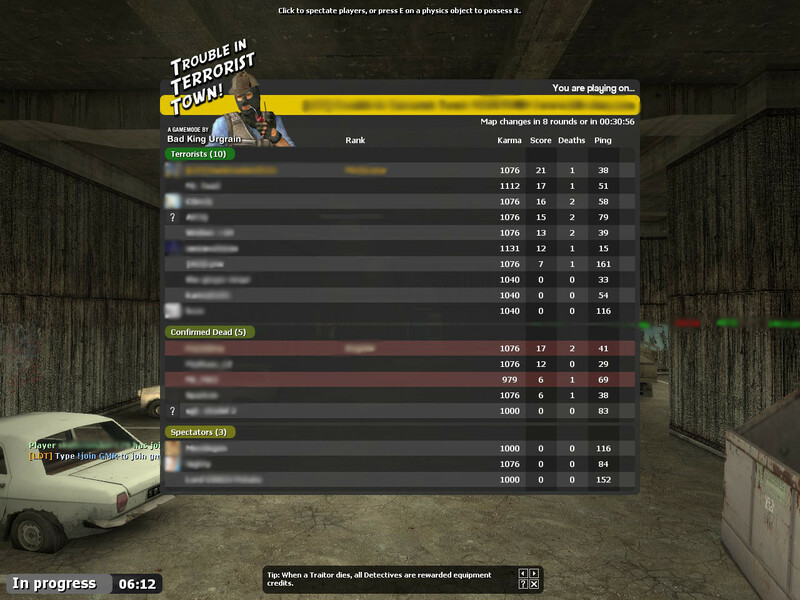 Once you find the body (when you pressed E), the player's name is moved to Confirmed Dead in the Scoreboard. As Traitor, your objective is to kill all of the Innocents and Detectives. You will know who is a fellow Traitor, because a red T will appear above their heads. You are given equipment to help you do this, which can be found in the Equipment Menu (C key). As Innocent, your objective is to avoid being killed by the Traitors. If you see a player being killed, and upon finding that the player who was killed is not a Traitor, you can kill the killer. As Detective, your objective is to find out who is a Traitor. One of those equipments is a DNA scanner, which can be used to scan the DNA found on a body, and give an indication of the killer's direction and distance from your position. 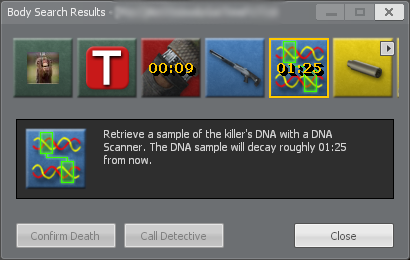 If you find DNA, and the body is not of a Traitor, you can follow the direction to the killer given by the DNA scanner, and kill the person that it leads to. Ghosting is when a spectator contacts a living player, and tells them information about the ongoing game which has been gained by their being a spectator. E.G. A spectator sees a Traitor named ABCDE killing an Innocent, the spectator then opens Steam Chat and messages their friend, who is still alive in game, telling him/her that ABCDE is a Traitor. This is Ghosting. RDM (Random Death Match) is when a player kills a member of their own group. A Traitor killing another Traitor is RDM. An Innocent killing a Detective or another Innocent is RDM. If an Innocent/Detective kills someone randomly, and the person killed happens a Traitor, this is still RDM. Note: If you kill a member of your own group in self-defense (If they are trying to RDM you) then this should not be counted as RDM on your part. As Traitor, the best way to stay alive is to kill Innocents when there are no Innocent witnesses. When you kill an Innocent, its up to you whether you find the body or not, there is no real advantage in doing so however. There will come a point when there are only 2 players still alive, you now must kill the remaining Innocent to end the game. But he will know that you are a Traitor, so he will try to kill you first. As Innocent, the best way to stay alive is to ensure that you are not alone with another player (Unless they are Detective), because they may be a Traitor. If you do find yourself alone with another player, then the following quickchat commands can be useful to alert other players of your situation. I'm with (player you aim at). I see (player you aim at). (player you aim at) is the traitor! (player you aim at) acts suspicious. For example, if you say "I'm with Quantumbit", and you are then killed by him, when your fellow Innocents find your body, they will know that the last person you were with was Quantumbit, so they will now suspect that he is a Traitor. On some maps, there is a Traitor Tester. As the name suggests, this is used to test if a player is a Traitor. It usually consists of some sort of chamber into which the player steps. A lever outwith the chamber is then operated by another player, a light will then come on whose color will indicate whether the player in the chamber is a Traitor or not. (Light is usually Red to indicate a Traitor, and Green to indicate an Innocent). All players are usually summoned to the Traitor Tester, and those who refuse to come to the tester, or refuse to enter it are then suspected to be a Traitor. When you are in the Traitor Tester, you are trapped for a few seconds until the result is given. and then kill the other player(s) in the room. Then they will only have one player (you) left to kill once you are released from the Traitor Tester. This makes killing the Innocents easier for the Traitor(s).